Npower objects to the recharging posts being called "juice points"
An energy company has threatened to sue a central London council for naming its free recharging posts for electric and hybrid cars as "juice points". Npower calls its renewable energy offer 'Npower juice' and accused Westminster Council of infringing its trademark. The council has said the firm was "out of step with the public mood" and asked it to reconsider the legal challenge. 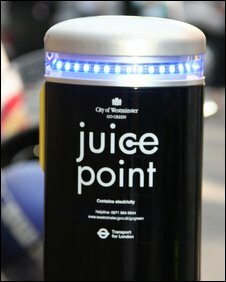 Juice points were introduced in London in December 2006 while the Npower juice package was introduced in 2001. The council said the energy company has sent legal documents related to the claim and the council in response has written a letter to them to try to stop legal action. Npower responded saying: "We're also surprised as they could have avoided any re-branding by carrying our simple and standard trade mark checks before they implemented their programme. "Greenpeace helped us to pioneer Npower juice back in 2001. It has grown to become such a market leading iconic brand that we feel there is a very real prospect of confusion together with a reduction in the impact of the brand. "We have spent many weeks attempting to resolve the issue with the council and we are more than happy to assist them in developing a suitable alternative name." Danny Chalkley, cabinet member for environment and transport in Westminster, said: "We believe Npower's actions fly in the face of popular opinion and show they are out of step with the public mood. "We will be taking this up with the Minister, the Mayor of London and Members of Parliament who may wish to look into the wider issues regarding the conduct of energy companies. "But there is still time for common sense to prevail and I hope Npower will reconsider their position, as we would value their support," he said. Westminster Council said a legal battle could cost up to £200,000.